The other day I came across an article from iVillage titled “The Real Sizes of Famous Women.” Adele, the Grammy Award winning singer, was the first beautiful woman shown in the gallery. I really like Adele’s soulful sound and often wondered how a young woman could translate her hurt and life’s lessons into such beautiful music. Because of the themes in her songs I looked upon her as a strong woman. After reading “the Real Sizes…” I had another ten reasons to love Adele and she grew ten times stronger. A very succinct quote accompanied her curvaceous photo. Now that’s what I’m talking about, rang through my head. Her words were so on the mark that I tweeted it. Throughout the day the quote was retweeted. Women and men identified with her perspective. It made me feel good to know that others believed that too. People are so much more than their clothes, body structure, and looks. But Karl Lagerfield didn’t think that. 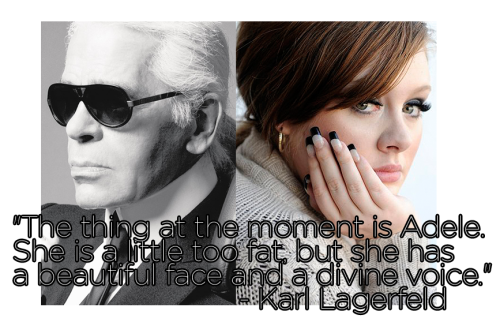 A few months back he began to say that Adele was the “thing” of the moment and ended up saying she was fat but she had a divine voice. After Lagerfield’s “a little too fat” quote hit the air, I think he went into hiding, thought twice about it and looked for the nearest spin doctor to concoct an apology. Too late. Flurries of interviews, tweets, and magazine articles repeated the quote. Even ‘my’ Anderson Cooper interviewed Adele for a “60 Minutes Overtime” segment. The infamous quote was repeated in that and several other interviews. His quote reminded me of a phrase I heard more than twice in my teens…’but you have such a pretty face.’ I never did have a comeback to these comments, except to roll my eyes at my mother. When she started on my own daughter I added a little more than the rolling of eyes, but nothing like Adele’s words. Adele was cool, self assured. During those interviews she gave us insightful words of wisdom which evidenced her self-confidence. Her healthy perspective gave us more bits of wisdom filled with positive self-image and strength. She offered this to young girls and women, who are bombarded with images of skinny-mini models: The first thing to do is be happy with yourself and appreciate your body– only then should you try to change things about yourself. 7. “I’ve never had a problem with the way I look. I’d rather have lunch with my friends than go to a gym. 8. I don’t want to go on a diet, I don’t want to eat a Caesar salad with no dressing, why would I do that? I ain’t got time for this, just be happy and don’t be stupid. I’m very partial to #8-10. I wish I had this list on the tip of my tongue when I heard my own “fat” phrase roll off my mother’s ‘just trying to be helpful’ tongue. Although I haven’t heard these comments in the last few years, I think I’ll have them ready if I ever hear similar phrases.